So hard for them to understand that doing things that span large swaths of public space tends to have collateral effects. You would think it would be easy, after all, because they do use the word "disruptive" rather proudly. But then there is this disconnect between what they do, what they expect to benefit from it, and what they do, and do not expect to be, held accountable for. Perhaps it is just the simple observation that, as companies were given rights equivalent to a citizen, they were also quite clever enough to make sure that these rights were equivalent only in regards to the ability to control where the profits go. After that, decades of economic history have shown quite clearly that they don't have to be responsible for anything more. They don't because they've become big enough to make sure they don't have to care. Doing whatever it takes with their money to do it. And the real problem here, certainly, isn't with these people. No. This is purely a case of "fool me once shame on you. Fool me more than once than shame the absolute hell out of me because that makes me a damn fool for letting it continue so long. Of course, to stop it from continuing would require that people actually start taking responsibility for themselves and demand to be governed by true, direct representation, so as to govern themselves. Something we could figure out how to do if we took the time to first admit that doing something is required in the first place. If you're happy being a damn fool dealing with unneeded disruption then fine. Hopefully the rest of us will wake the hell up before it is too late. 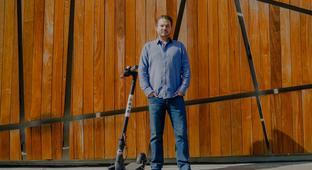 Travis VanderZanden, chief executive of electric scooter start-up Bird, is unperturbed by how San Francisco and other cities are in an uproar over the dockless vehicles.